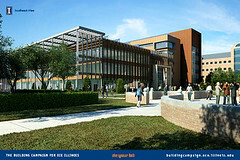 Adjacent to the Beckman Institute and across from the Coordinated Science Laboratory on the northern edge of campus, the new ECE building will locate the department and all of its activities in the heart of the University’s center for groundbreaking high-tech research. 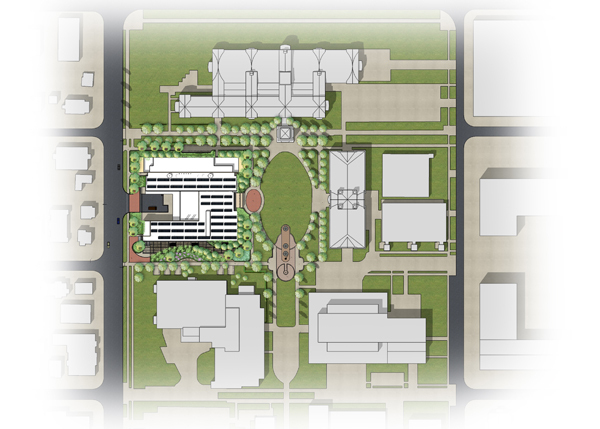 The approximate 230,000 square feet of classrooms, labs, and administrative facilities will create an environment conducive to interdisciplinary learning, where the development of knowledge and new ideas will flourish. The building was designed by SmithGroup, one the oldest architectural firms in the country, and a leader in sustainability in design. Read an interview with lead architect David King. With the new ECE building the University is determined to achieve LEED platinum certification, and is striving for a net-zero energy design that will enable the building to supply all of its own energy. From a vast array of photovoltaic cells, to a chilled beam system to cool and heat the classroom tower, ECE wil accomplish a major campus addition with maximum space and minimal carbon footprint. A major focus for this building will be on student study and collaboration spaces. Nearly 8% of the completed building will be dedicated to such spaces, which will include offices for student groups, as well as lounges and other areas where students can interact with one another and with faculty. The student groups’ offices will be located in the heart of the building, ensuring vibrant interaction with fellow students. With these student spaces, the department will take advantage of the education that occurs outside of the classroom, facilitating the ability of faculty to meet with students in a more informal setting and enabling students to learn from each other as they work and meet every day. In addition, instructional labs will make up 28% of the new space, and classrooms and the auditorium making up an additional 18% of the space. ECE 110 Lab: ECE 110 is the freshman ECE course that introduces students to the variety of fields within ECE in their first year. A culmination of the lab experience for this course is the design and construction of a robot car. Fab Lab: The Fab Lab has been a major part of the ECE experience for decades. Generations of students have honed the skills needed to create integrated circuits on silicon in this lab. Many former students of this lab have gone on to distinguished careers in the integrated circuit industry. In the new building the Fabrication Lab will have nearly 3,900 square feet of instructional space. Both of these student labs will be showcased in the new building, providing visitors opportunities to watch as the future leaders of the field learn the fundamental skills that will ensure their success.